I found an envelope on the road. 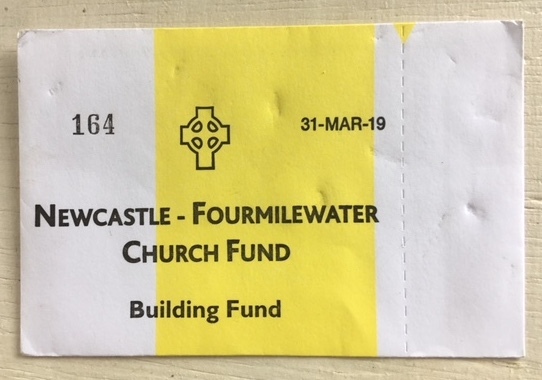 It is printed bright yellow and white and is for the Building Fund of the two churches of Newcastle and Fourmilewater. They are two separate churches but they are joined as a parish. If there is a mass at one of the churches on a Sunday there will not be a mass at the other. I think there is only one priest between them. 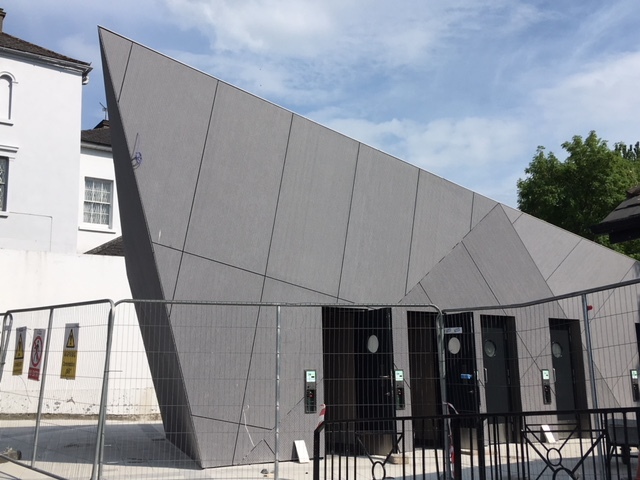 I do not know which building is being worked on. Maybe it is both. The date 31 March 2019 suggests that there is no rush to turn in one’s envelope. The heat is extraordinary. They are giving more heat and higher and higher temperatures for the coming week. The temperatures are bigger than any we can usually expect. Haying is being done everywhere. Haying is the only thing being done with a sense of frenzy. Except for the sounds of those machines, the countryside is quiet. Even the birds seem to be resting somewhere in the shade. 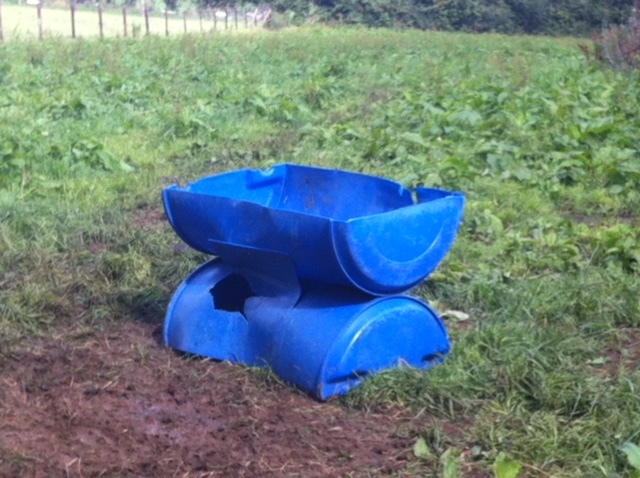 One plastic barrel cut in half makes a fine feeding place. The barrels used like this are always bright blue. I do not know what came in the barrels originally, but I love them in the fields for as long as they last. The cows bump into them in their eagerness to eat and eventually the plastic cracks and the whole thing falls to the ground. We went to John the Post’s retirement party. John has not been well for several years now. We kept hoping that he would get better and that he would return to work. He has not been able to drive because of his neck and his throat and his head, so he waited and waited thinking that the various treatments would allow him to begin driving again. Now he has accepted that the various treatments are not going to get him back behind the wheel, so he has officially retired. The little group around John was all postmen. A few of them had themselves retired in the last few years. Others were still working. They were all wearing cotton short-sleeved shirts of a particular summery type. They almost looked like they were wearing an official off-duty uniform. The bar was covered with dark wood inside and it was very quiet and cool. We were the only people, except for John’s sister, who were not postmen. There were no postwomen. No doubt some other people arrived after we left. I enjoyed talking with the postmen. Tom was there. He had been John’s substitute for a while but now he has his own route. He is now up and down in the Nire Valley, in the Comeraghs and almost all the way to Dungarvan. His route covers an enormous area. Most of the postman do not want this winding, climbing, difficult route, especially in winter. Tom is happy to do it and happy too because his grandfather used to do the exact same route but on a bicycle. He knows delivering the post in his van is easy in comparison. Besides the difficult driving, the other postmen do not like this route because there are so many people on it who are related to each other. Tom said that there are a tremendous number of Ryans in the Nire and several are brothers who do not speak to one another so if the simple mistake is made that the wrong letter gets delivered to the wrong Ryan all hell breaks loose. Another postman told us about a different postman who did that route for a while. The man only used four tyres a year while all of the other postmen used at least twelve tyres a year. This postman only did about 20,000 miles a year on his van while everyone else did 60 or 70,000. The man was eventually called in for some questioning by the administration. The man had figured out a system to make his work life easier. He would go to the creamery and wait around while the farmers came to drop in their milk or to pick up supplies. He would hand-deliver the post to whoever arrived and then he would ask people to drop things off at their neighbours on their way home. He also went to any and all funerals in the area and did his deliveries by hand from outside the church, after giving his condolences to the bereaved. I took the car to Mike for some work. He told me that we are promised a heat wave today. People are ready for it or at least some people are ready for it. Some people are wearing shorts and t-shirts while others are wearing wind-proof jackets all zipped-up. I saw one woman wearing an enormous white fur hat with sparkly things sewn into it. She looked hot but she also looked very proud of her hat. Mike told me that the heat wave will begin at half two. He said it will be over by tea time. This was his joke. 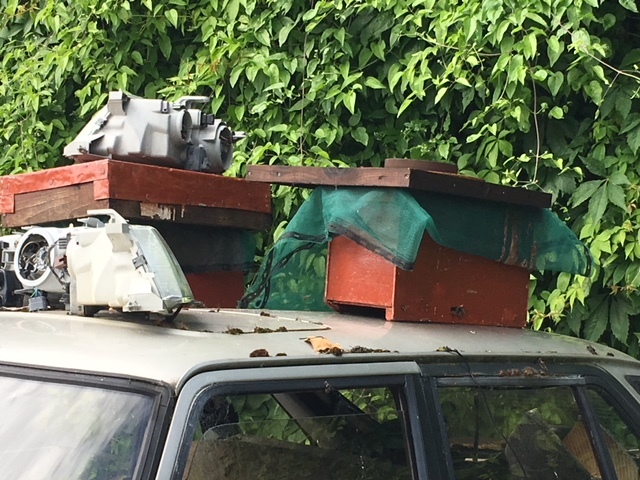 Mike has bee hives on the top of four wrecked cars in his yard. 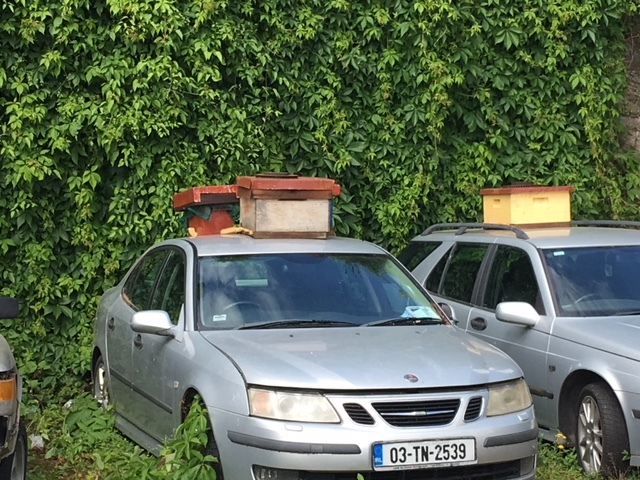 The cars have one, two or three hives on their roofs. Each hive has a bit of metal something from a car to weight the tops down. All of the hives are homemade and they are painted in different colours. My favourite is the pale yellow one. An 83-year old friend brought the hives and a few queens over from Burncourt to attract fresh workers to his community of bees. The man has already taken two hives away and there are lots of bees swarming around the remaining hives. The four cars are all Saabs. Mike loves Saabs. They are his preferred car to work on. He is saving these old cars for parts. 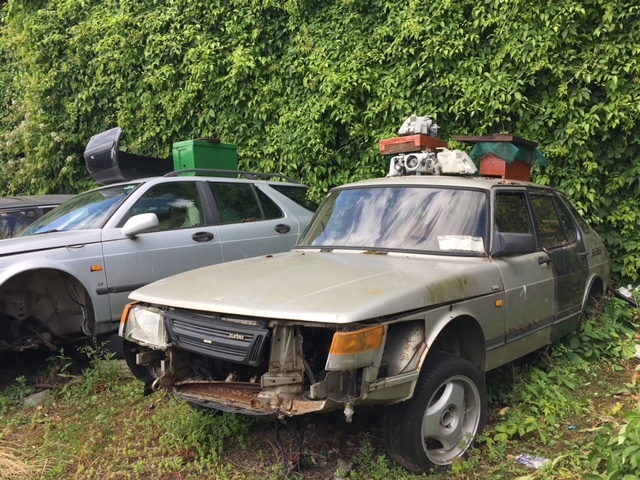 When there is not much work, he rebuilds old Saabs and makes them good and then he sells them and rebuilds another. 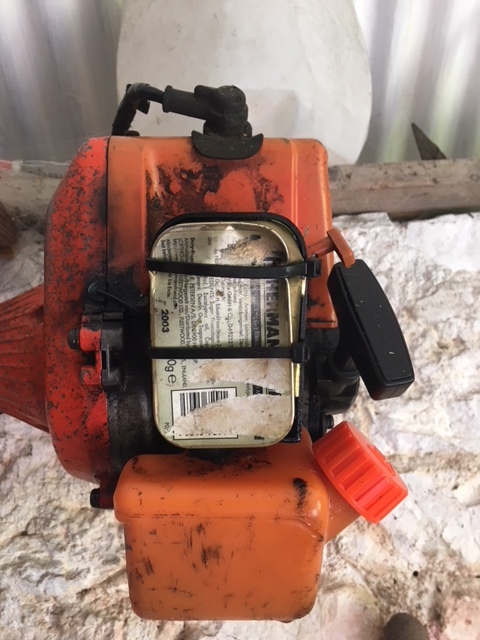 Right now he needs a piece out of one of the Saabs but he thinks he will have to wait till the bees have been taken away. Mike has learned a lot about bees because the bee-keeping friend tells him things and then people like me come along and ask a lot of questions and he is able to pass on the new knowledge. He said that most bees in America are African bees and that they are very aggressive. The strains here came from other places and they are more relaxed. I believe him, but I still prefer not to go too close. 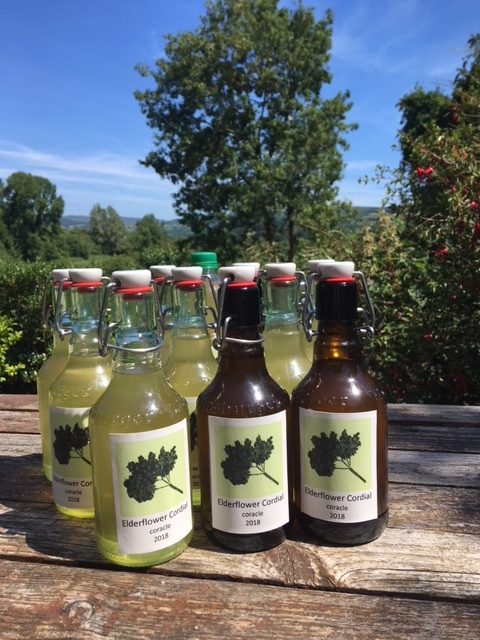 The Elderflower Cordial has been strained and decanted into bottles. Twelve and a half bottles is this years supply. The bottles have been labelled. Simon thought he was doing me a great favour by cutting out the labels and gluing them onto the bottles. Labelling the bottles is my favourite part of the making. I felt a bit disappointed but I did not tell him that. I just said thank you. There were four little girls standing outside the stone wall. I was just walking along the road. I did not recognize any of the girls. Three of them were holding hands and singing sweetly over the wall to a cluster of wobbly young calves. The calves looked interested and excited to have this performance. Probably they were confused. The one girl who was not singing shushed me with her finger on her lips. She told me that we must be very quiet because baby calves prefer music to talking. 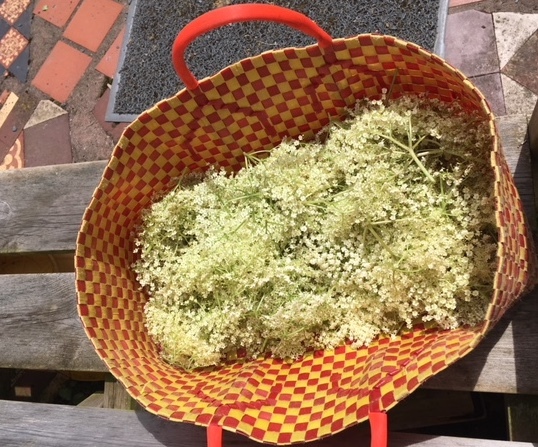 Forty large elderflower blossoms took no time to collect. The countryside is covered with the creamy blossoms. Sometimes they all look easily available but in fact they are too high and way to get near to them is surrounded by nettles. Today was easy. I needed twenty blossoms for a batch of cordial and I planned to make two batches. Forty blossoms plus a few extra. I cut off all the leaves and most of the thick stems. The mixture is now out on the table in a covered pan. It needs to sit and steep for twenty fours hours. Tomorrow I shall bottle it. I took fresh strawberries to Tommie and Margaret. As I stood at the door I looked down and saw a white envelope from Lourdes addressed to Tommie and Mgt. Hally in blue biro. On top of the envelope was a small bottle of Holy Water. I picked the two things up off the ground just as Tommie opened the door. I handed him the Holy Water and the envelope with one hand and the strawberries with the other. It was a confusing moment. He was thrilled with the strawberries and he was thrilled by the Holy Water. He barely knew which to deal with first. He whispered “Oh, They went to Lourdes and now they are back.” I do not know who the They were, the people who had gone to Lourdes and so kindly brought back the Holy Water. I was pleased to see how happy he was about the gifts. I was interested in Mgt. as an abbreviation for Margaret. On entering Cahir for the Farmers Market the road is often full of parked cars. Every Saturday there is some kind of game being played by the children in the sports field. The cars of the parents are parked all along on both sides of the road. With cars parked along both sides the road becomes a single lane road. Some Saturdays there is also a funeral at the church. The church is across from the playing fields. Once the car park is full the cars spill out onto the road for a long way in either direction. One can tell how big a funeral is by the number of cars. If the road is really blocked up we know that the family was well-known in town and maybe related to a lot of people. Today there was a huge event following the death of a woman named Mary. I know very little about this Mary, but I know a little. She was the receptionist at the Surgery. The eye doctor and her husband both have their practices in a bungalow on the edge of town. There are two doors to enter the two surgeries and inside in the centre is one desk. Mary took care of the patients who entered in the left hand door for Dr John and his practice as a General Practitioner. She also took care of the patients who entered from the right hand door for Dr. Bernie who is an Eye Specialist. She was completely efficient and she never forgot anyone’s name. She had an exuberance which made you feel that no one had a more fun or happy job. Between endless phone calls and the patients coming in and going out of the two doors she made everyone feel that they were lucky to be there and that she was lucky too. Mary was in her early fifties. She was walking down a road on Wednesday with her niece, or maybe it was a nephew, who was on a bicycle. The road is a very long and very straight stretch of road. It used to a be the busy main road on the way to Mitchellstown and Cork, but since the motorway was built, it is an extremely quiet road. Anyone going in either direction on the road can see for a mile up the road. There is a wide space along the road for people to walk safely or for tractors and slow moving vehicles. Mary was hit by a car. No doubt it was the only car on the road. Whenever I am on that road I am always the only car on the road. The road is never busy. The car hit Mary but it did not hit the child. Mary was killed. The community is shocked. The funeral this morning was packed. Death in a small community affects so many people. Even if one does not know the family there is always a connection no matter how small. We all feel a need to show our shock and sadness. The word tragedy is used again and again. 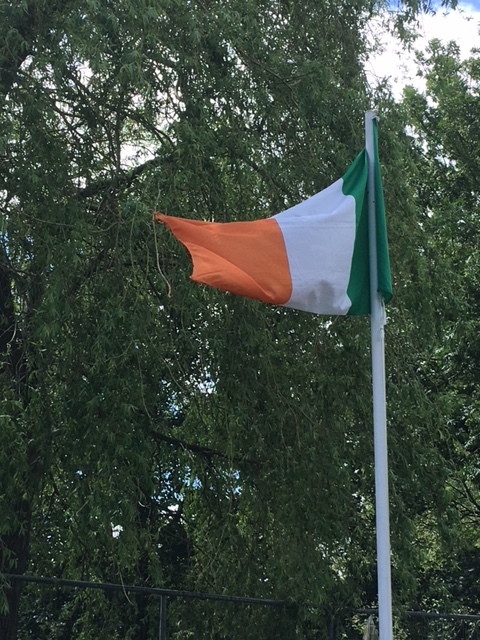 The Irish flag down in the village near to the bottle bank looks like it is blowing in the breeze. It looks like it is blowing in the breeze all the time. Yesterday was a wildly gusty day and the edge of the flag got caught on a branch. Now the wind is no longer blowing but the flag is still in blowing position. 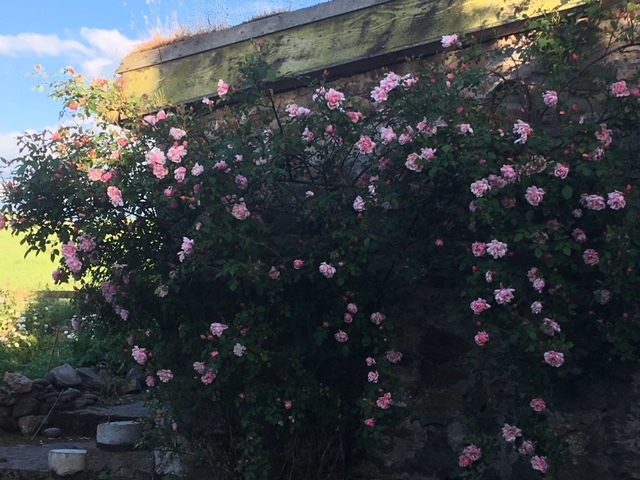 The roses on the side of the grass-roofed shed are better and more plentiful than they have ever been. We have never had so many in bloom all at the same time. The smell makes me dizzy when I walk past to my room. This is Kattie English’s Albertine rose. It is the only plant remaining from her life here, so I feel it is important to take good care of it and to keep it healthy. It is barely possible to cut these roses and to bring them into the house. They last a few hours and make a thick perfume in a room, and then they droop and die. They are best enjoyed where they grow. 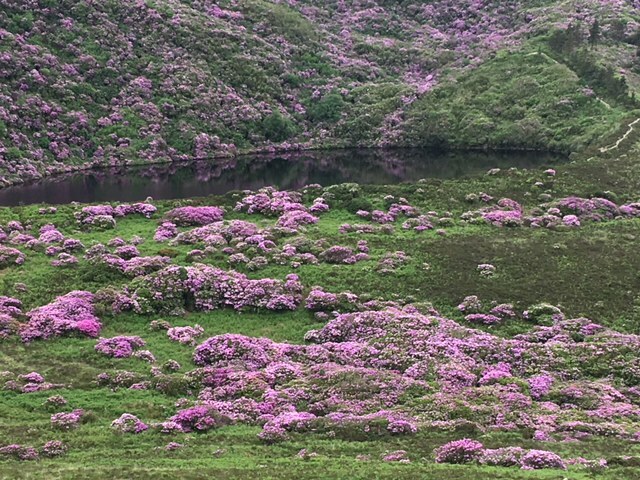 Rhododendrons are in bloom all the way up into the mountains. They are late this year but they are as beautiful as ever. I am glad we remembered to drive up to see them. It is easy to wait a little while and then suddenly it is too late. The blossom do not last long. Shades of pink and lavender and purple line roads and paths. The sides of the hills glow with the soft colours. 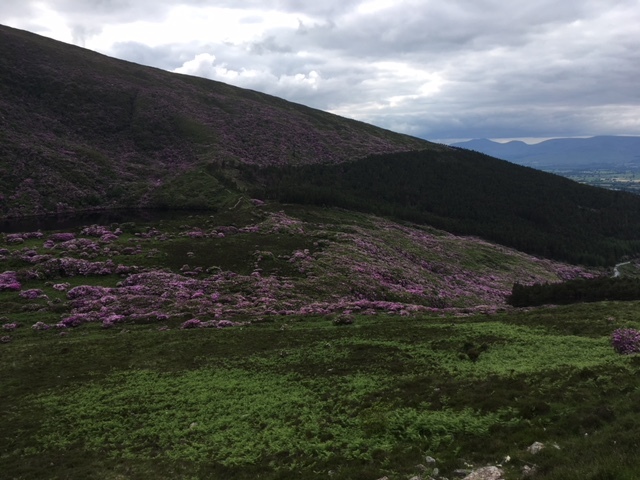 The rhododendrons in the Knockmealdowns are a much maligned pest. They have invaded and grown like weeds spreading everywhere and choking out a lot of other more indigenous plants. People speak in despair about these enormous invasive shrubs or trees. Some of them really are trees. They are big enough to be trees. 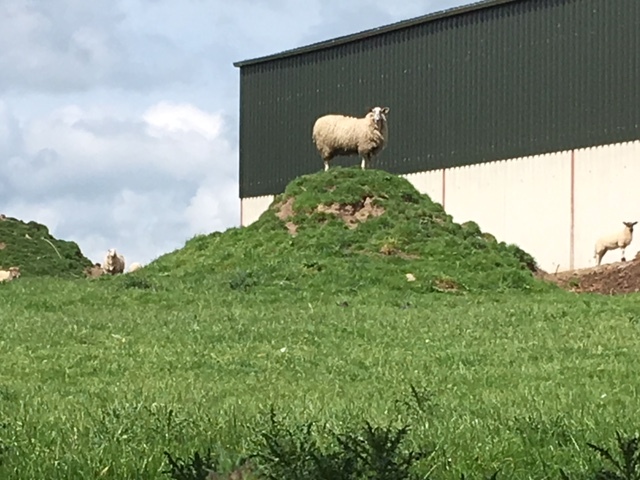 Sheep farmers curse them. But for two weeks every year the rhododendrons are adored. Festivals are organized to go walking among the rhododendrons and millions of photographs are taken. When the two weeks are over we can return to worrying about how they are running rampant and taking over all of the other vegetation. 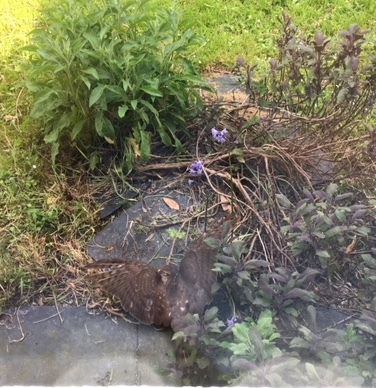 And I shall not have to struggle with spelling the word rhododendron for another year. I overheard the woman in the shop saying that Shay had been Off Dagging. She said it again and again. She said that Shay had been Dagging Again. I feel I know a lot of local vocabulary and that even if I do not know exactly what a word means I usually know enough to be able to unearth its meaning. I think that context is enough for clues. I think that if I focus on the context I am certain to arrive at the correct definition. Knowing that Shay was Dagging Again just left me in quiet confusion. I had no idea what Dagging was nor where to begin in knowing what it was describing. I did not even know who the Shay that the woman was talking about was, so the fact that Shay was Off Dagging Again was an impossible thing to solve all by myself. I could not ask the woman because that would suggest that I had been eavesdropping which of course I was doing but I was not eavesdropping in a nosy kind of way. I was just standing behind the woman as I waited in the shop and she was talking loudly and for a long time. How could I not listen and how could I not pay attention? I could not leave the shop until she stopped talking and moved from the counter. I could only hope that the mystery of Shay and his Dagging would get solved before she left. I could not interrupt and ask what Dagging meant. Later I asked Breda for an explanation. She told me that Dagging was the same as Mitching. As a word, Mitching left me just as confused as Dagging. Eventually I learned that it was all about not going to school when one was supposed to be attending school. The English called it Skiving. We called it Playing Hooky or Skipping School. At least with Skipping School, the word School was included and that gave a major clue. Skipping attached to the word school made it obvious, at least to me. Dagging and Mitching and Skiving sound dangerous and exotic in comparison. Day after day of sun and heat. It feels like we are living somewhere else. 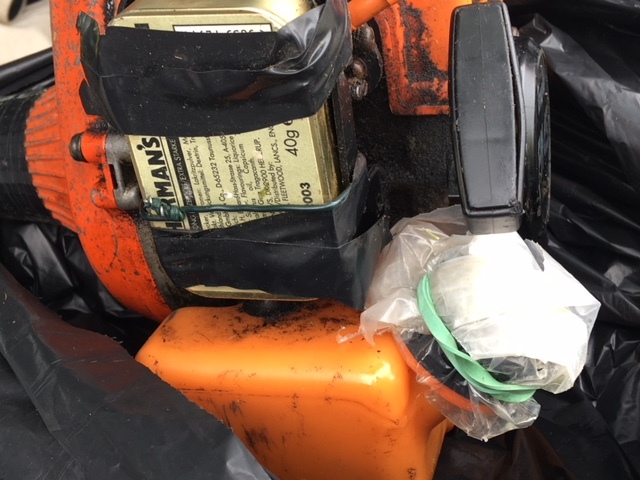 It is impossible to walk up the mass path as it is too hot to wear long trousers and long sleeves and there are too many nettles and brambles along the way to grab and rip at any unprotected skin. Walking must be done in other directions. And it has been dry for so long now that it is not just the farmers who are wishing for rain. The haying is getting done which is good but lawns are brown and the grass is not growing which is not good. I cannot believe that I am hoping for rain. The leaks in the roof have not been fixed yet although we do have a plan ready for the fixing. Why do I want to battle with rain running down the walls when I can have day after day of sun? The hedgerows are full of the cow parsley skeletons, the sticky weed is dying back and the wild honeysuckle is blooming. Jim and Keith had some beautiful fat Egyptian garlics on their stand today. 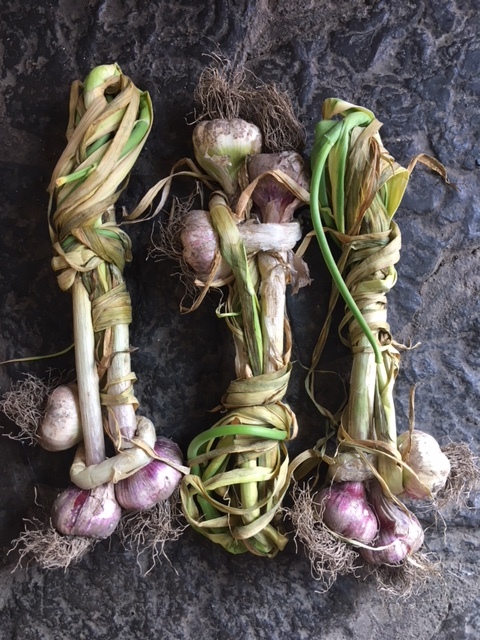 The garlics themselves are lovely and plump but the way that the green tops are woven together is what is really lovely. Every single person who sees the garlics reaches out to touch them and to comment upon them. The garlics are grown locally by one of the members of the Egyptian Coptic church which is located in what used to be a Catholic convent. The nuns lived there for years and they ran a school for girls. The nuns have mostly died off. Now the convent is the home for an order of Coptic monks. The garlics are grown by the monks or maybe by just one monk who brings them to the market and gives them to Jim and Keith to sell. I think he just gives them the garlics and he does not even ask for any money in return. Perhaps he has so many garlics that he just wants to share them. They are bigger than most garlic we ever get around here. The bulbs are more purple and they are milder. Every single person comments on the garlics and some people buy them saying that they never buy garlic but they feel that they need to buy this garlic. All of this enthusiasm annoys Keith. Sometimes he announces that Jim grows garlic too. It is like he is defending Jim’s garlic even though it is not really the same thing. Jim’s garlics taste good but they never look like a gift. They never appear with such presentation. They arrive in a jumble in a box and we buy them and we eat them and we enjoy them. The Egyptian garlic gets a lot of attention which is not solely about the eating.